Uneven ball top on square base. Originally decorated a fence, rooftop or turrets. Not only fabulous as a garden decoration, but as an interior accent as well. Beautiful age patina. 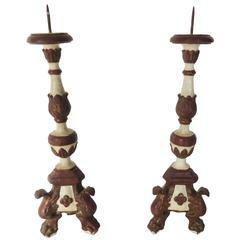 Size finial: 38 " H x 19 " Sq Size other finial: 37 " H x 18 " Sq. Fluted wax pan on twisted rod standard supported on tripod base. New wood candle with original bee wax finish. 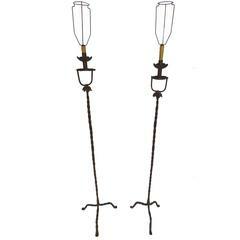 Each with wax pan raised on a twisted standard ending on three arched strap supports. The round mirror plate surrounded by giltwood sunburst with alternating length. Period: Giltwood sunburst: 18th century Giltwood round mirror: 20th century. 18th century Spanish stone carved coat of arms Spanish family emblem hand-carved in stone, from Castilla. Pair of late 18th century walnut Italian corbels from the Italian piedmon.